Now is the time to finish your final harvest as anything left on plants, trees, and vines on Samhain, October 31st is for the wildlife, gods, and goddesses to enjoy. It is time, if you can, to can fruits and vegetables. To pick, during the right Moon phase for optimal power, and dry your herbs. To stick up on other non-perishables you have to buy, put extra meat and homemade or store bread in your freezer. I even buy a small thing of powdered milk in case we get snowed in. I also check to make sure I have all my magickal supplies, candles, herbs, oils, etc, stocked and ready for use. I also make sure I have my Yule log under a trap so I don’t have a problem lighting on the Winter Solstice. Whenever possible I do a ritual outdoors for Samhain and the Winter Solstice because I do not have any type of fireplace indoors. As for my home now is when I do a fall cleaning and through smudging in every room and my basement. I want to make sure I do not have any negativity in my home before the windows are closed and the furnace turned on giving it and/or nasty beings a place to hide in. Please tell us what you do to get ready for you he darker and colder time of the year. Leave as long a comment as you want to. I hope I can get some new ideas from others on preparing for this time of year. Yule falls at the Midwinter Solstice, when the nights are longer and the days shorter than at any other time of the year. Yule corresponds in many ways with the Northern Hemisphere Christian Christmas festival, and is associated with the Alban Arthan (Scottish). The history behind this is that the early Christian Church sought to gain converts by placing its festivals on or near the existing Pagan festivals. I am sorry for getting this posted to close to the Sabbat gathering. This Sabbat is written and lead by our Adept Maia. In the Northern hemisphere it is the longest day of the year. We celebrate Litha. The sun has risen as high as it can and seems to be at a standstill and then begins to fade more each day. We gather here to honour the Gods and Goddesses who have united to bring fertility. We are grateful for the abundance of life and light. We are blessed with the riches of Mother Earth. In the Southern Hemisphere it is the shortest day of the year. We celebrate Yule. It is the dark half of the year. The nights have been long and the earth has been waiting to be reborn. Each new day will bring more light and the earth will once again be warm. We welcome the longer days and the rebirth of the Sun God Ra. We are blessed with the promise of the riches of Mother Earth. I will now call the Watchtowers. I call the Watchtower of the East to protect those inside and outside our circle today. I ask the Goddess Bridid to walk this circle three times three to lend us her power and energy as we gather here today. I ask the Sun God Ra to honour us with his presence and blessings. Merry greet Brothers and Sisters of the craft. Please type in your name and the country you are in. Please light the red and green candles. Gods and Goddesses we thank you for the abundance that you have blessed us with. Seeds are sown and we await the harvest that will come in the months to follow. We are grateful for your blessings. Gods and Goddesses we give thanks for the awakening of Mother Earth. As the sun climbs higher each day we are grateful for the return of light and warmth. We are grateful for your blessings. Close your eyes and think about your goals for the future. See yourself accomplishing them. Feel the energy and power of the sun. When you are finished type So Be It! Gather the four corners of the cloth together and tie the string around them to make a pouch. You may use it as decoration in your home, carry it with you, or leave it on your alter. We thank the Gods and Goddesses for hearing our call. I dismiss the Watchtower of the East with thanks for their energy and protection here today. I dismiss the Goddess Brigid and the Sun God Ra with love and thanks to return from where they came from. Thank you Brothers and Sisters for joining us this day. 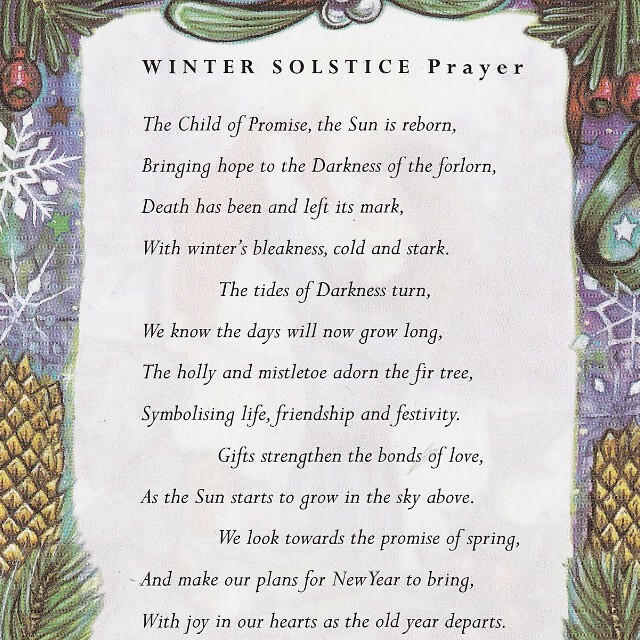 May your Litha/Yule celebration be filled with love and laughter. Until Merry we meet again. I invite you to include your children and/or grandchildren in our circle this evening. The ritual may seem a bit childish to some of you but I am trying something new for families who wish to raise their families in the ways of The Craft. 2 Battery Operated Candle ( one should be painted or markers used to make the stick of the candle black. Do not get on the “candle flame” as this may cause to explode. If you choose to have anyone attend our gathering you and they can decide whether regular or battery operated candles are use. Please keep a careful with children and the elderly around the open candle flames. Remember it is always SAFETY FIRST with every magickal thing you do. Lady Beltane: I walk this circle with all of you three times round so we are safe and sound. I call upon Earth to come into the watchtower of the North to help protect those in this circle. I call upon Air to come into the watchtower of the East to help protect those in this circle. I call in Fire to come into the watchtower of the South to help protect those in this circle. I call upon Water to come into the watchtower of the East to help protect those in this circle. As the Oak Kings brings the longest night his battle lost to the Holly King. We bid you safe slumber with our love and thankfulness until we meet again. We will meditate for 2 minutes to honor the Oak King. Now light or turn on your white candle while repeating this spell 3 times. Type in “So Mote It Be” when done. As we light our candles we bring light back into the world. We welcome the birth of the Holly King and the festive joy that he brings. As the Holly King loses his battle and the Oak King is born. We wish the Holly King a restful slumber with our love and thanks for all he has helped us with. We will meditate for 2 minutes to honor the Holly King. 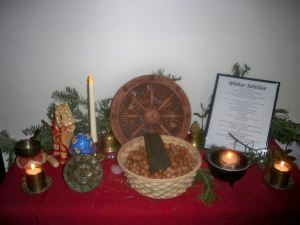 LADY BELTANE : I bring to each of you a blessing of peace, love, good will, and light on behalf of the Triple Goddess and her consort the Holly King. From myself I wish you positive energy, good cheer and happiness. EVERYONE : Partake of your beverage and cookie and if you would like to say anything to the rest of the coven you are welcome to do so now. LADY BELTANE: I dismiss Water from the watchtower of the West with our living thanks for your help and protection. I dismiss Air from the watchtower of the North with our living thanks for your help and protection. I dismiss Earth from the watchtower of the North with our living thanks for your help and protection. The circle is open but never broken. Go in peace and love dear ones.